Is India bracing for a Proactive Strategy in South Asia and Indo-Pacific Region? Indian strategic practices were not only shaped by Kautilya’s pragmatic ideas contained in his magnum opus ‘Arthashastra’ and practices of ancient kings and medieval rulers, equally and importantly, the doctrines of non-violence inherent in the philosophy of Buddhism and Gandhian idea and practice of Satyagraha, exerted a decisive impact on India’s strategic thinking. These different strands of philosophical traditions gave rise to Indian ways of strategic thinking and practices. The philosophical undercurrents of non-violence tempered Indian notions of pragmatism and helped engender a doctrine of strategic self-restraint. While Prof. George Tanham, a specialist on South Asian security affairs working for RAND Corporation based on his findings from a study of the impacts of historical and cultural factors on India’s strategic thinking asserted that India lacked formal and systematic strategic planning and therefore a strategic culture, his conceptualization of strategic culture predominantly represented a western perspective on security and was more defined in terms of proactive military engagements and systematic long-term strategic planning which not only stood at variance with Indian strategic thinking, the doctrine of strategic restraint lay bare his narrow perspective on strategic culture. Its strategic culture while restrained India from adopting a militaristically adventurist foreign policy, it allowed necessary measures to address its defence concerns. India’s first Prime Minister Jawaharlal Nehru argued: “No Government of any country dare allow its country to be unprepared for contingencies” (For details on Nehruvian perspective on security see R. Sagar, “State of Mind: What kind of power will India become?”, International Affairs, Vol. 85, No. 4, 2009, p. 804). Despite confusion within India’s foreign policy circle due to lack of resources and dominant threat perceptions emanating from countries such as China and Pakistan in the region, India never sacrificed its preference for strategic self-restraint. India took time and tested its first nuclear device in 1974 but called it a peaceful nuclear explosion to avert fuss and chaos in the neighborhood. In the face of heightened threat perceptions looming in the region from a nuclear China and Beijing’s assistance to Islamabad in its covert nuclear arsenal build-up programme, it was only after a gap of about two and a half decades that India conducted another test making its military purpose clear in 1998. Islamabad’s nuclear test closely following on the hills of New Delhi corroborated the argument that Pakistan’s nuclear programme and ambitions were sustained and augmented by China for long. Similarly, the Indian forces after successfully assisting the liberation of Bangladesh from the west-Pakistan’s territorial claims (now Pakistan) could have moved further in the western direction to assert dominance over Pakistan. India did not even use the Pakistani prisoners of war (POWs) captured in liberated Bangladesh as a means to control the bilateral relationship according to its desire. During the Kargil war in 1999, Indian forces were constantly made aware not to cross the Line of Control (LOC) – the de-facto borderline between India and Pakistan despite Islamabad’s defiance of the ceasefire-line and last incursion. In the face of Islamabad’s and Beijing’s nuclear threat, India committed itself to a ‘nuclear doctrine’ combining the principles of ‘no first use’ (NFU) and ‘credible minimum deterrence’ which was announced under the ‘Nuclear Command Authority’ on January 4, 2003. As per the doctrine, India would develop as much nuclear weapon capacity as it would deem necessary for defence purpose while it would not use a nuclear threat proactively. In the 2+2 meeting concluded between India and the US on September 6, 2018, which devoted more time to discussions on the American imperative of shaping the contours of Indo-Pacific policy has seemingly brought India closer to the US in sharing similar viewpoints with some adjustments (for instance, India’s stance on ASEAN centrality to the Indian Ocean Region was reflected) in the joint statement on the their role and aspirations in the Indo-Pacific region. It is noteworthy that the Trump Administration seems to be working hard to inspire and recruit stable partners in the Indo-Pacific region in the face of rising prominence of the Chinese role under the rubric of ‘Belt and Road Initiative’ (BRI). India while remained reluctant to share the objectives of the other members of the Quad (America, Japan and Australia) and strengthen the quadrilateral format of US-Japan-India-Australia primarily as a means to contain Chinese influence, it took a broader view of its Indo-Pacific policy by inviting Russia, the ASEAN member-states and China (there were reports related to India-China maritime dialogue at the joint-secretary level to bring back normalcy to bilateral relations after Doklam standoff) to help maintain free and open Ocean for trade and navigation which was explicit in India’s Prime Minister Modi’s speech at Shangri-La Dialogue on June 1, 2018. The verbatim of the joint statement implied to target at the Chinese BRI project. India capitulated to the US objectives, for instance, the joint statement noted: “Noting the importance of infrastructure and connectivity for the Indo-Pacific region, both sides emphasized the need to work collectively with other partner countries to support transparent, responsible and sustainable debt financing practices in infrastructure development.” (For details see, Press Information Bureau, Government of India, Ministry of Defence, “Joint Statement on the Inaugural India-US 2+2 Ministerial Dialogue”, 06, September 2018, available at http://pib.nic.in/newsite/PrintRelease.aspx?relid=183300) While three other members of the Quad had agreed to the US-led infrastructure development earlier, India’s commitment was limited to maintain free, open and inclusive Indo-Pacific region. But the joint statement indicated Indian involvement in a proactive Indo-Pacific policy led by the US. In July 2018, the US Secretary of State Mike Pompeo announced $113 million in new technology, energy, and infrastructure initiatives with the objective of casting the US as a trustworthy partner in the Indo-Pacific region and some days later he pledged to provide $300 million in new security funding for the region (L. Wroughton and D. Brunnstrom “Wary of China’s rise, Pompeo announces U.S. initiatives in emerging Asia,” Reuters, July 30, 2018, available at https://www.reuters.com/article/us-usa-trade/wary-of-chinas-rise-pompeo-announces-us-initiatives-in-emerging-asia-idUSKBN1KK0V5). All these announcements indicate the nascent but desperate American drive to formulate a ‘grand strategy’ – a proactive strategy as conceptualized by Tanham to contain the rising Chinese influence in the region. Australia’s foreign minister Julie Bishop said: “Australia, the United States, and Japan have announced a trilateral partnership to invest in projects…that would build infrastructure, address development challenges, increase connectivity, and promote economic growth” towards the end of July 2018 (J. Pearlman, “US, Japan and Australia sign infrastructure agreement to counter China’s belt and road,” The Telegraph, July 31, 2018, available at https://www.telegraph.co.uk/news/2018/07/31/us-japan-australia-sign-infrastructure-agreement-counter-chinas/ ). 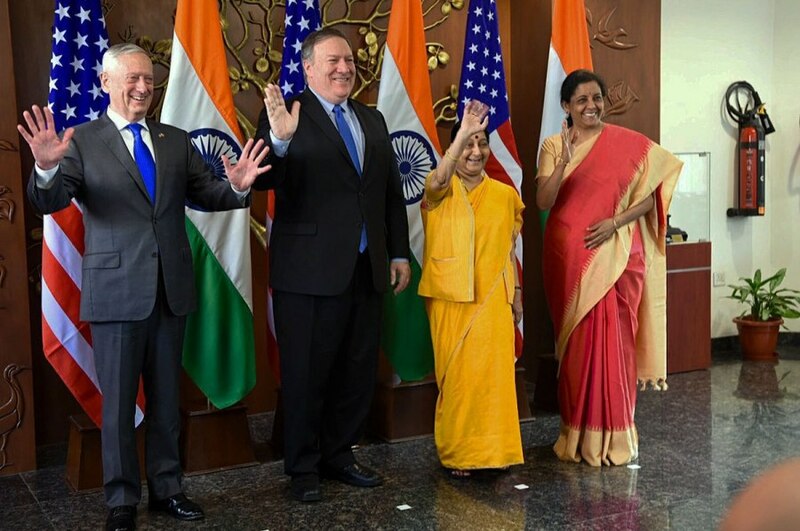 The joint statement after the conclusion of the 2+2 meeting indicated that India later joined the initiatives to assume a proactive role in the Indo-Pacific region. It is widely believed that the defence pact is known as Communications Compatibility and Security Agreement (COMCASA) which was signed during the 2+2 dialogue would not only facilitate Indian military platforms’ access to encrypted, cutting edge and high-end secured communication equipment from the US, it would also enable India to put Chinese moves in the Indian Ocean and Himalayas under close surveillance. The agreement would not only allow interoperability between the US and Indian armed and naval forces, but the US would also be able to notice Indian military operations, and it would not be surprising that India may be goaded to take a proactive military stance in the Indo-Pacific and South Asian region. The US and India have also agreed to conduct a tri-service military exercise in the dialogue. While the Russian news agency Sputnik reported that India wanted to purchase a remotely piloted aircraft system that could operate at an altitude of more than 5,500 meters above sea level primarily aimed at detecting military activities along the mountainous border with China (“India Looks to Procure Spy Drones to Operate at High Altitudes”, Sputnik, 3 September 2018), data on arms transfers released by Stockholm International Peace Research Institute (SIPRI) pointed to a sharp rise in India’s arms imports to a whopping 24% between 2008-12 and 2013-17 periods which projected India as the world’s largest arms importer accounting for 12% of the total global imports for the period 2013-17 (India is world’s largest weapons importer: SIPRI report, Indian Express, 13 March 2018). India’s move towards enhanced military preparedness seems to imply proactive strategic aspirations rather than mere defensive requirements.